Editor’s Note: From the time students start kindergarten, they learn about the importance of being kind and generous toward others. But what happens to young people’s understanding of that message around the holidays, when the excitement of receiving shiny gifts overtakes the season? What happens when some of those students are more fortunate than others? Paul Chylinski, activities director at Loara High School in Anaheim Union High School District in California, along with some of his student government representatives, decided to take steps to make holiday activities more inclusive. Chylinski just wrapped up “Love Week” which involves a host of creative ways to make students feel special. Some time ago, members of the student government that I advise came to me to share something that most, if not all, teachers have experienced at this time of year — that uncomfortable feeling when casual talk of holiday vacations and presents comes to dominate the hallways and the realization that not everyone is participating. Schools bring together hundreds, often thousands of kids, from all different economic backgrounds, and the reality is that some are more financially fortunate than others. This group of students was determined to do something about that. We started the “Winter Wishes” program as a way to grant the wishes of as many students as possible this holiday season. As activities director and student government advisor, I receive the Google form that students use to make their wishes. I got one this year that broke my heart. A student had written to say his mother had been ill and had fallen on some hard times. They were struggling to make the rent, buy food and pay the bills. He asked for some money so that his mother wouldn’t feel she had let her children down. I shared the story with another teacher and her husband who later handed me a $250 Visa Gift card and $250 Wal-Mart card to give to the student. We presented it confidentially; the student almost collapsed with joy. After working as an activities director and social science teacher for 26 years, I have come to realize that the biggest lesson we can teach our kids is about love and acceptance inside and outside of the classroom. Although these lessons need to be taught throughout the school year, the holidays are a particularly important time to let kids know they matter. Our first year of Winter Wishes started small, giving away shirts and yearbooks that we could afford. Many items were donated by our own faculty. This year, using social media, we reached out to our alumni association and many others to collect more than $4,000 in cash donations as well as items from laptops to dentist visits. One request came from a student with two sisters, one of whom has Down syndrome, who lived with their mother who is unable to work. The reality check came when this student asked our group, how come you go to the movies so much? Her family had never been to the movies, or gone out to dinner. The Winter Wishes program contributed $50 to go to an Italian restaurant and four movie tickets. They plan to see the Chipmunk movie because the youngest got to choose. In an effort to understand the students at our school on more of a human level, two students asked to start a Facebook/Instagram blog called Humans of Loara High School, modeled after the popular Humans of New York. We presented one of the co-founders with a laptop right before our student government meeting adjourned for the holidays — in fact, it was the winter wish of three other students that she receive the laptop. This student had been using her phone to create the site and borrowing friends’ computers. I think you should see the reaction for yourself. More than anything, we want our kids to feel loved no matter where they come from, what race or religion they are, what gender they identify with or most of all, what their economic status is. No one should feel lesser than, especially around the holidays. 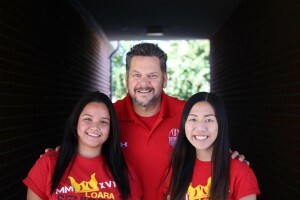 Left: Paul Chylinski with Gabriela Mariscal and Katherine Pham, co-founders of "Humans of Loara High School."